As expected, BOC Governor Stephen Poloz and his gang of policymakers decided to sit on their hands for the time being, keeping the benchmark interest rate unchanged at 0.50%. In their official statement, central bank authorities acknowledged that some of the downside pressures on core inflation have been offset by the recent depreciation of the Canadian dollar. Policymakers also noted that solid household spending and the firm recovery in the U.S. are supporting Canada’s economic prospects. 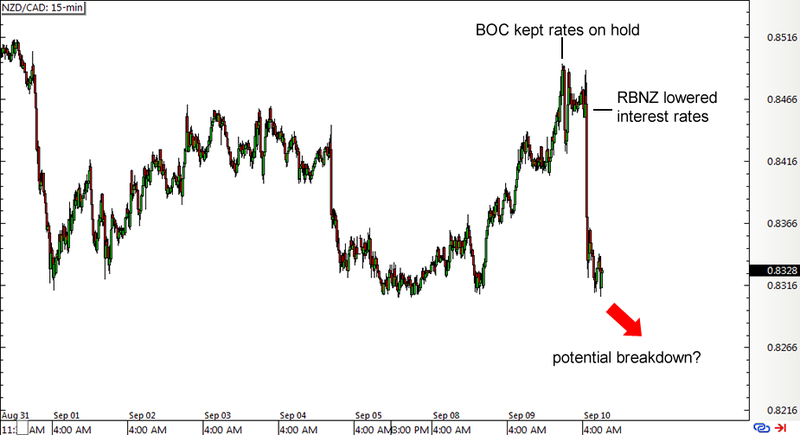 In other words, the folks over at the BOC don’t seem to be too concerned about a potential slowdown just yet. As I’ve mentioned in my RBNZ statement preview, the central bank was widely expected to announce back-to-back rate cuts. And that’s exactly what they did! After lowering the official cash rate (OCR) from 3.25% to 3.00% in July, RBNZ head Graeme Wheeler decided to take it down to 2.75% in this week’s policy decision. While Wheeler also said that the Kiwi’s depreciation is helping mitigate some of the effects of falling commodity prices, he emphasized that export activity still remains feeble. How do I make forex profits from all this? Excellent question! As you’ve probably learned from our School of Pipsology on Fundamental Analysis, you can be able to ride forex trends by pairing a relatively strong currency with a weaker one. In this case, you’ve got the BOC suggesting that no further rate cuts are likely while the RBNZ hinted that additional easing is possible, which means that the Loonie has a much stronger footing compared to the Kiwi. If you’ve already thought of shorting NZD/CAD during all this, give yourself a pat on the back! But if you’ve missed the sharp forex selloff following the BOC and RBNZ policy announcements, there might still be a chance to catch a potential breakdown.